The first international conference “Sustainable Development. Culture. Education” of the Journal of Teacher Education and Training (since 2007 – Journal of Teacher Education for Sustainability or JTEFS) was held on May 11-14, 2003 in Daugavpils University (Latvia). During the conference, participants defined such concepts as sustainable development, education and culture, examined the potential for using an inter-disciplinary and systemic approach for implementation of ESD and discussed the need for reorientation of teacher education towards sustainability. The second international conference “Sustainable Development. Culture. Education” of the Journal of Teacher Education and Training (since 2007 – Journal of Teacher Education for Sustainability or JTEFS) was held on April 14-16, 2004 and organised by Tallinn Pedagogical University (Estonia). Participants discussed the concept of sustainable development and its diverse understandings, especially in the context of education, as well as explored the main challenges on the way towards sustainable development. Experience was shared about local approaches that are used for promoting ESD in various countries. The third international conference “Sustainable Development. Culture. Education” of the Journal of Teacher Education and Training (since 2007 – Journal of Teacher Education for Sustainability or JTEFS) was held on May 22-24, 2005 and organised by Vechta University (Germany). The sub-theme of the conference was “Holistic Education”. Experience exchange initiated during the previous conference continued. The landmark event of this conference was the establishment of Baltic and Black sea Circle Consortium in educational research (BBCC). New contacts were sought among conference participants. Diversity in the understanding of the concept ‘holistic education’ in different countries was discussed. The fourth international conference “Sustainable Development. Culture. Education” of the Journal of Teacher Education and Training (since 2007 – Journal of Teacher Education for Sustainability or JTEFS) was held on May 31 - June 3, 2006 and organised by the Department of Applied Sciences of Education of the University of Helsinki (Finland). The sub-theme of the conference was “Education for Democracy as a Part of Education for Sustainable Development”. Te link between sustainability, education and culture was intensified. The issue of ESD in various levels of education (teacher education and continuing education, lifelong education, self-education, general education, democracy education etc.) was explored. The fifth international conference “Sustainable Development. Culture. Education” of the Journal of Teacher Education for Sustainability (JTEFS) was held on May 30 - June 2, 2007 and organised by the Department of Applied Ecology of the University of Debrecen. The sub- theme of the Conference was “Theories and Practices for Education of Sustainable Development”. Participants explored such issues as sustainability philosophy, educational models and distance education, teacher education, higher education and pre-school education in the context of ESD, methodological, economic and information-related problems of sustainable education, environmental management and media etc. The sixth international conference “Sustainable Development. Culture. Education” of the Journal of Teacher Education for Sustainability (JTEFS) was held on June 4-7, 2008 and organised by the Division of Educational Administration, Supervision, Economics and Planning, Education Faculty, University of Anadolu. The sub-theme of the conference was “Collaboration in Education for Sustainable Development”. Participants discussed research into ESD, sustainable education and multi cultural studies, comparative education studies, collaboration educational culture etc. The seventh international conference “Sustainable Development. Culture. 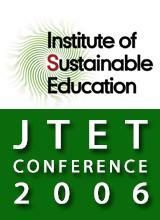 Education” of the Journal of Teacher Education for Sustainability (JTEFS) was held on May 5-8, 2009 and organised by the Institute of Sustainable Education of Daugavpils University. The sub-theme of the conference was “Research and Implementation of Education for Sustainable Development”, which allowed for a great diversity of contributions under the suggested sections of conference. Participants discussed such issues as phenomenology of ESD, research of ESD, reorientation of teacher education to address sustainability, sustainability in higher education, creation of research and educational environment in all levels of general education, ESD and e-learning, as well as Earth Charter as a framework and a multicultural approach to ESD. The eighth international conference “Sustainable Development. Culture. Education” of the Journal of Teacher Education for Sustainability (JTEFS) was held on May 5-8, 2009 and organised by the Institute of Sustainable Education of Daugavpils University in close cooperation with its partners from Baltic and Black sea Circle Consortium in educational research (BBCC) and UNESCO. The sub-theme of the conference was “BBCC Mission – Reorientation of Teacher Education and Research in Education for Sustainable Development”.